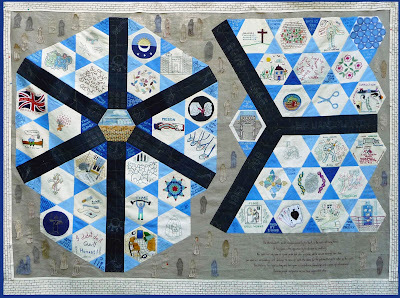 If you’re in London Town before this Sunday 4th, you must pop down and take a trip through time with the Victoria and Albert Museums’ insightful quilt exhibition! Ok, ‘quilts’. I know, its hardly a ravingly new and exciting sounding topic, infact I’ll gladly admit it conjured images of little grannies holding up pieces of fuddy old fabric to their inch-thick spectacles but take a step back, open your mind and you’ll see there were whole generations of myths, stories, meanings and heartaches all threaded into the quilts. 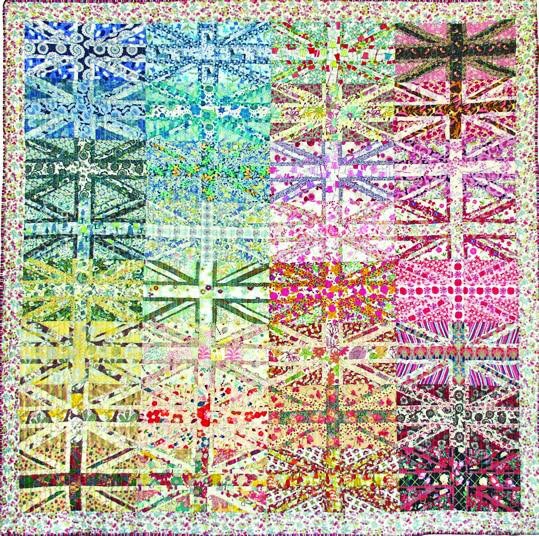 Quilt by Elisabeth Chapman, 1892. This is a detail from the back of a ‘coverlet’. It shows how the maker used cut out shapes from old recipets and bits pf scrap paper found at home to stiffen the fabric pieces. You can also see the weeny stitches made, its maddeningly small! 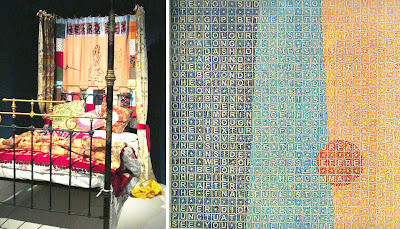 The 1841 Rajah quilt, sewn by female prisoners on an anxious ship voyage and detail from patchwork bed hangings 1730-50. From V&A quilt site. 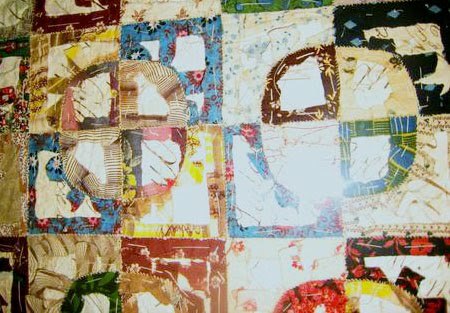 Thats not all, the quilts aren’t just snippets of history lessons but they motivate you to try your hand at your own and looking at modern works open your eyes to the possibilities. Talking of modern pieces, (ranging from pieces by Tracey Emin to a group of inmates at Wandworth prison) many of them pushed the traditional ideas of quilting with projects such as mapping the number of war deaths with mini photographs and teeny quares of newsprint to recreating the scenic view out of a window and rubbing ink over the relief. The Wandsworth Prison Fine Cell Works group quilt, commissioned fro the exhibition shows an insight into the daily life, hopes and fears and amazing quilting skill of prisoners. My favourite quilt of all! 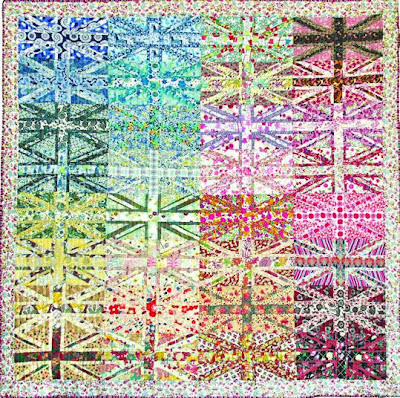 : Janey Forgans’ Liberty Jack quilt using Liberty of London archive fabrics, 2008. I adore this naturally for its colour and pattern! Lots of modern quilting books have lovely bright garden and home designs like this one. Tracey Emins’ pretty, modern bed with quilted phrases such as ‘I cry in a world of sleep’. 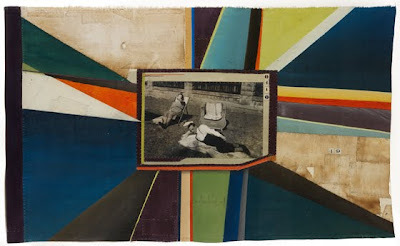 From Liberty website and Sara Impeys’ modern quilt named ‘Punctuation’ with a poem revealed by stitching the negative space. Found on The Dyers Hand. 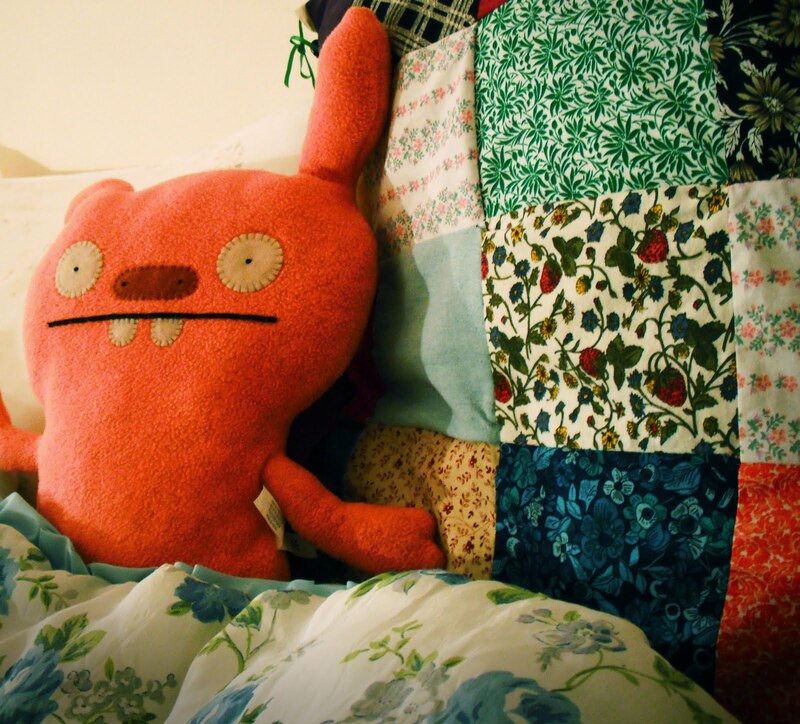 A little quilt proj of my own, a pillow case, so easy to make a cheap cusion look pretty! This exhibition was very impressive and certainly taught me about the ways of life of the past in a far more interesting manner than sitting in the classroom! My only disappointment though, came from some of the modern pieces which I felt interrupted the flow of the chronological journey, they would have been better off in their own section. As for the ultra-feminist pieces, the tooo widly associated and the tooo arty farty, I say no thanks. They seem naff against pieces that were slaved over for more serious reasons. I sensed that many of the older vistors (ok so ALL the visitors were on their WI trip that day it appeared) didn’t appreciate those comtemporary add-ons. Don’t let this stop you going though, go see for yourself (£6 ish for students). All the quilts speak beauty, you just have to go and find your favourite story. For other exhibitions, don’t forget to check in the ‘Shows and Must Sees’ column to the right! >Ooh, I really wanted to see this, too late dammit! I love the V&A, it's my favourite museum. Helps that the gift shop and the cafe are amazing too! >thank-you for commenting on my blog! you really should get a membership, it's seriously such a brilliant investment! I have a student plus guest membership which intitles me and a guest to unlimited free entry to exhibitions, the v&a magazine, discount in the shop and cafe, special members events, and of course previewing the exhibitions a day before they officially open! 🙂 my final piece is on my blog, just a few posts down. have you seen any of natasha kerr's other work? i went to the quilts conference a couple of weeks ago, and as part of that i was invited to go to her studio to see her in person and also see her work up close. i just adore her work, so detailed! I actually quite like that fact that the contempary was embedded with the historic quilts, as they did link to the main themes of the exhibition. >I've heard so much about this. Really wish I could make it!